How did you get the chance to shoot the band ? Like most things in life, combinations play a huge part. As you know, Angus’s older brother, George, was a member of the legendary Australian band the Easybeats, so AC/DC had a formidable and extremely credible back up.It also helped that Angus was a terrific guitar player and Bon was a terrific singer. (Sometimes cover versions of classic songs can be sad disappointments, but their version of ‘Baby Please Don’t Go’ was the real deal!) 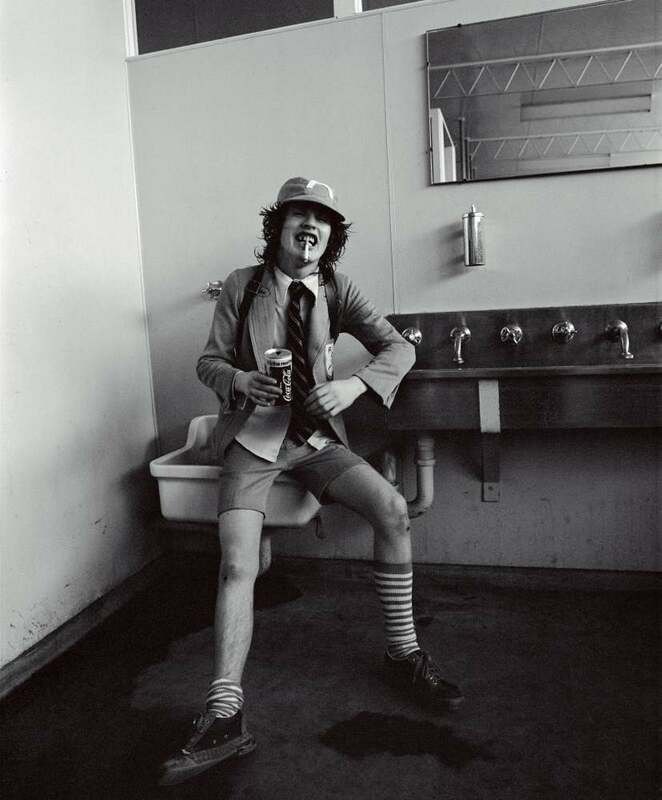 In 1975 AC/DC were an up and coming band and there was a bit of a buzz in the industry, particularly about them performing at the Station Hotel, in Prahran, near where I lived. And at the same time they were playing lunchtime concerts at schools in working class suburbs to build their fan base. Altona Nth Tech was one of those concerts. 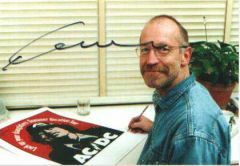 At that time, many of my photos appeared in the prestigious ‘Juke’ magazine, which was pretty much an Australian version of Rolling Stone, so AC/DC’s management were more than helpful. What gear did you use ? In the dunnies, (toilets), I used a Mamiya RB67, where Bon was only too willing to open his fly to reveal his tats… it was his idea. Only later on, did I learn the birds were swallows. A mischievous visual pun, I guess. You chose black and white. Could you please explain why ? It was early, cowboy days in the rock'n'roll industry. Most reproduction was in black and white due to economics. Full colour photography was something quite special, and was reserved for things like album covers. Do you have other pictures of that session in your archives ? No... not really. The whole session took about 1/2hour. It was painless. It was totally 'subject driven' and I got 4 usable pictures out of it.You know when a session has 'peaked'. I was never keen to hang around, like a bad smell, and ask for variations on a theme. Did you see the band live again? Never did. I ran into Bon a couple of weeks later at a club in Melbourne and he was still chuckling about his new tats on his lower tummy. 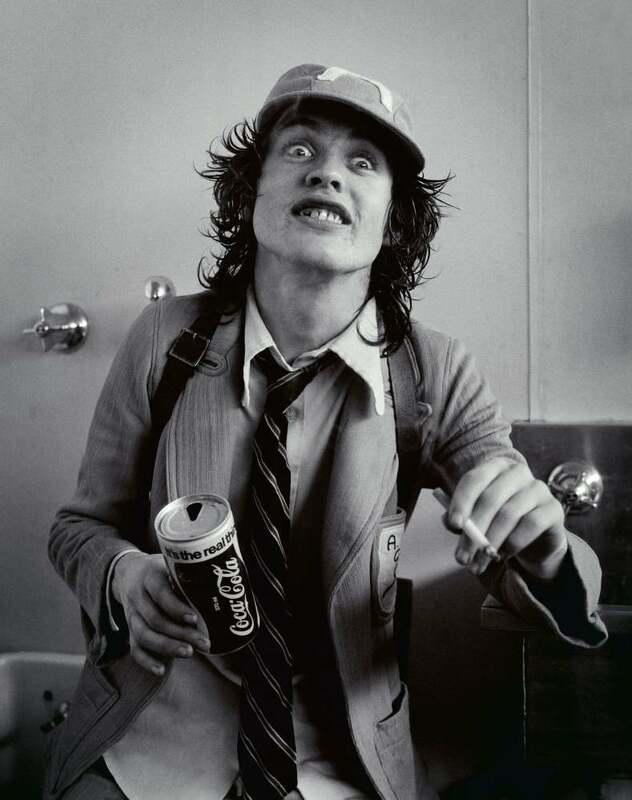 Did you manage to shoot them live in melbourne during their concert on July 6th 1977 at the Altona North Technical School ? 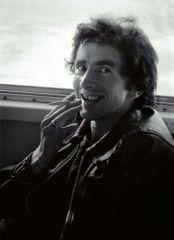 Was the picture of Bon Scott in front of the bus taken before or after the show ? It seems like the concert was filmed? do you recall seeing video cameras ? I don't recall seeing any video cameras. Can't help you there. Do you have any anecdotes you would like to share with us ? Bon the larrikin is my enduring memory. Have you followed the band's career until today ? It's pretty hard to miss what the band's up to today... so yes. Thanks a lot Graeme !! !